Skype is in trend these days; people love to connect via video calls with their friends and relatives sitting at far corner of world. Skype is also very popular among business owners and hr executives as they use this software for taking interviews as well as for creating lessons. But the major need of hour is to record all video calls over Skype as the software itself do not feature recording facility. Software developers these days have developed so many solutions for this problem but Pamela is gaining more popularity among all. This software application is available for free and is much easier to operate for professionals as well as beginners. Pamela is compatible with Window 10, 8, 7 as well as on Vista for both 32 and 64 bit versions. It offers all amazing features for initiating complete control over Skype call recording users can also customize details as per need. It offers free of cost Skype call as well as chats recording. Call recording is initiated automatically. Pamela also possesses an advanced conference call manager. It comes with an auto answering machine. There is an option for contact customization and to create birthday reminders. The free version of this software can work only for maximum 15 minutes of audio call and 5 minutes of video call. It is not compatible with Mac and Linux platform. The professional edition is heavily priced: $24.95. Basic: The basic version of Pamela is available for free that offers maximum 5 minute video call recording and 15 minutes of audio recording. The local answering machine, birthday notifications and auto chat reply features are included. Call Recorder: You can avail the licensed version of this software with payment of 14,95 € that can offer unlimited audio/video recording whereas with free version you can have 5/15 minute video/audio recording facility. It does not provide birthday notifications and local answering machine is also missing. Professional: You can download a 30 days trial version with limited features but for all impressive features you need to pay 24,95 €. It assists users in unlimited audio/ video recording along with all stunning features except priority support and call recording toolbar. Business: The Business edition of Pamela is designed for industrialists and it offers priority support along with call recording toolbar facility. All incredible features of this software application can be accessed with payment of 39,95 €. You can also download the 30 days trial version as a beginner. How to use Pamela for Skype? Step 1: Visit the home page of Pamela and select the software version that you need for your current Skype account. 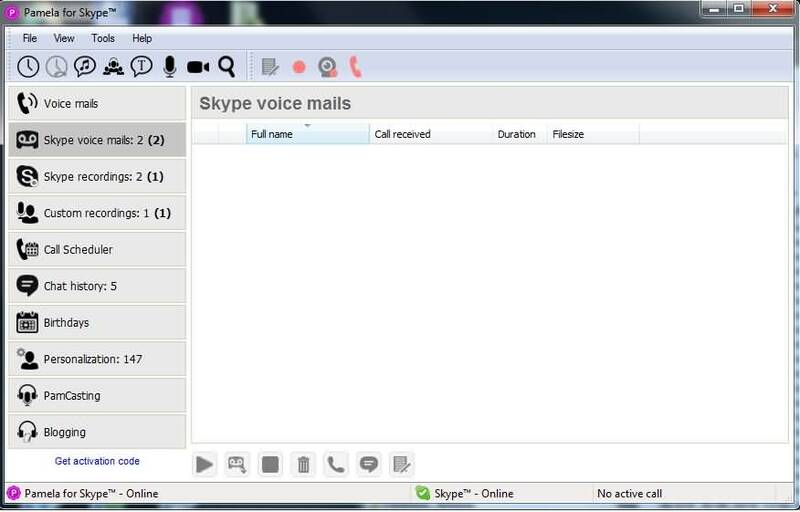 Step 2: Once your software is downloaded then it will create an automatic pop up window on the top portion of the Skype interface. Here you need to click on Allow Access option. Step 3: Now whenever you will initiate a call using Skype, the pop up window asking for record function will appear on screen and you simply need to press on ‘Yes’ to start recording. If you are not a professional or heavy Skype user and need just a basic Skype call recording tool with all necessary features then we suggest you to download Filmora scrn Screen Recorder Software. This recording software tool is available for free and offers unlimited audio-video recording hours. It can record both the screen and the webcam. Also, there are plenty video effects in the video editing tool. Filmora Scrn can assist users on Mac as well as Window platform with all incredible features so it is good to download now from official site.